Today is Flag Day here in the USA. My son James is a Boy Scout and I got him up early and we put up flags around our neighborhood. I though since I am up and the sun is just peaking over the mountains here in the Salt Lake Valley I just had to show off how the quilt is looking. I have the center of the top completed, this is the biggest to date pieced top for me. I am still debating (wife tells me she wants it a little bigger then planned) about how big I want the borders. So tonight I will be looking at the amount of light gray and dark gray I have and figure out how I can do the borders. You can see with the top row folded over the swing set it hangs quite a bit down. My guess is its just under twin size now? Last Saturday we took my mother in law to visit her son in vernal (3 hours from my home) while she was visiting us (5 hours from her home). We were all sitting around the couch admiring Julia when she rolled on her side and I thought it was so cute I had to take a picture. Showing off she flipped onto her tummy. She now just 4 days later is not content to lay on her back any more and she has even rolled her self over and slept on her tummy. At 11 weeks old this is a pretty big accomplishment for her and she is ahead of the norms on doing such. She is going to be mobile soon. Last Thursday my family took a drive up to Silver Lake (near Brighton Ski Resort in Utah) to show my mother in law the mountains here in the valley (she is from southern Utah and said the northern mountains are not worth visiting and we wanted to show her they were). Any way some one saw me holding a camera and said oh did you see the mother and baby moose? I have never seen moose up here, yet they have signs all over telling about them. I ended up hiking a mile before I got close enough to take this picture. It was taken from about 1/4 mile away (Even though it looks 10 feet away) thanks to my 400 zoom lenses on my Nikon D90 I was able to take this. About 4 minutes after I took this picture, the baby walked out into the open to take a drink. I went to take a picture and the camera just did nothing. Note to self, to not miss cute baby moose bring an extra battery. Yawn I know who cares about all of that I said something about a giveaway. First off I want to say that all of my giveaways have been provided by me. I do not yet have any sponsors (but would love some if any one is looking to do that) . I do have some advertisements from Google displayed on my blog and I do get a little money from that (note little means at current rate a year tell I will get a check). If you like any of the things in the advertisements please click on them and check them out. Each click will increase the amount of giveaway's that I am able to do. Alright enough of that. On to what I am giving. Sadly I am not sure what that will be as of today, but I wanted to tell you how to enter. Yesterday started the Beehive Shop Hop and the Wasatch Front Shop Hop's here in Utah. I would like to share some love from what I get along the way between the 2 their are about 30 stores. I have taken off today and Friday from work. Tanya, Rebecca my 14 year old, Julia and I are going to go visit as many of them as we can. Last night Tanya and I visited 3 of them on the way out to dinner. We got 16 fat quarters and material to make one of the block's that they gave the pattern away from. No I did not win any of these, but I would like to share some of the love once we get back from our adventures. I plan to take the camera and share some pictures. So the what is not known but will be in the next 2 days now on to the how. I have been doing a Link A Finish Friday every week for the last 18 weeks and I would like to increase the awareness of it. As such I would like to give to those that link up. So any one that has already linked up in June or any one that does link up between now and the end of the month will be entered. Please make sure the email listed on the link is valid for you or leave a comment on one of the posts linking too you. 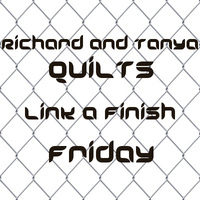 http://richardquilts.blogspot.com/search/label/LAFF is a link to the tag for the most recent posts. Also at the top of my blog in the main page is a re-cap page for all previous LAFF (Link a Finish Friday in short). Also I have got a new button that you can put on your blog though its not required to win. (note to self if this works out and it gets a good response we will have a giveaway every month on those who link up). Oh one last thing on the LAFF I understand that not every one has a finish every week. If you have progress on your quilts link that up I still want to see what your working on. I love seeing your quilts and Julia's progress. Julia really is ahead of herself in the rolling over category. She is so sweet. You guys are too kind..great thing you are doing...thanks for the chance to win. Loving the way the batik quilt is turning out. Hope you guys have fun on the shop hops. Oh goodie - that means I'm in the drawing!!! :*) I just love your batik quilt! It's done in my colors! Love your Batik quilt. I am hoping I can build up some Batiks as I can. Love them. You did a great job. Julia is so precious! Love the pictures of her, too. I put the button on my sidebar. =) I love the quilt you are doing, and I do think it's around a twin size. These are wonderful pictures of Julia, and that moose is amazing! Before I take a trip, I make sure my D50 battery is charged fully. Then I can usually get about 700 pictures, even with flash. I've tested it at quilt shows! It's an L-ion battery, though, a one piece one, not the little ones. I don't know what the D90 has.